I'm trying out an orange mix before I paint it on Carla. I know, I know, I should be further along at this point-- I agree completely! I've gone back and forth on which colors to paint her. 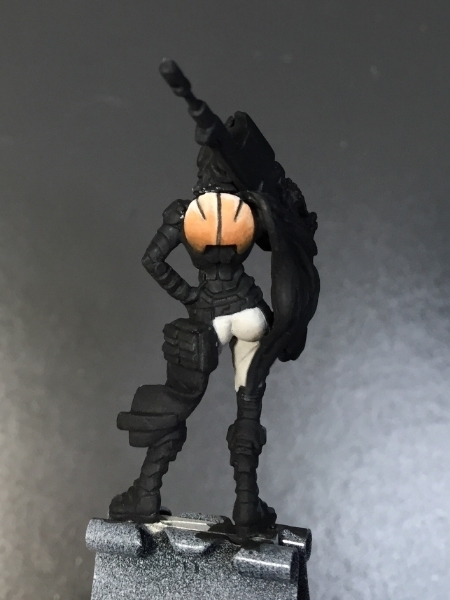 I've had some hit-and-miss success with Cat's Eye Base from Reaper's Heavy Gear Blitz Master Series Paint Set. The pants are a mix of Fallout Grey and Pure white, with Brown Liner as the dark contrast. The orange Cat's Eye Base, Bone Shadow, and Pure White as the edge highlights. For some of the darkest shadows, I've mixed a little Brown Liner into the Bone Shadow for a very thin glaze. I find it's fairly hard to blend the orange into the brown smoothly, and I think the reason is my struggle with the paint consistency/opacity. I'm glad I'm testing this out first before I apply it to my it-has-to-be-perfect 75mm. I should also mention I realize it's very ill-advised to paint light colors on dark primer, but let's overlook that ;) I'm ready to move forward!